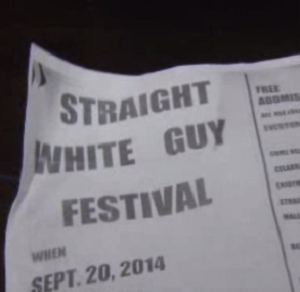 Flyers for a Straight White Guy Festival have been distributed in Ohio. The flyer, which was distributed across Columbus, claims that the festival will be held on September 20 in Goodale Park, the site of the city’s gay pride event. It is unclear who is responsible for the flyers, or if they really intend to hold a straight pride event. The city told WBNS-10 that no permits have been filed for any such event. Equality advocate Michael Premo said: “This kind of thing implies there’s some kind of struggle going on for being a straight white person in Ohio. Straight white people are doing just fine. A ‘hetero pride’ campaign launched in Italy in April this year. A group named Straight Pride UK last year claimed to campaign for “full straight equality”, but deleted its website and social media account after it used US copyright law to remove an article showing it supports homophobic laws on a British student blogger’s website.